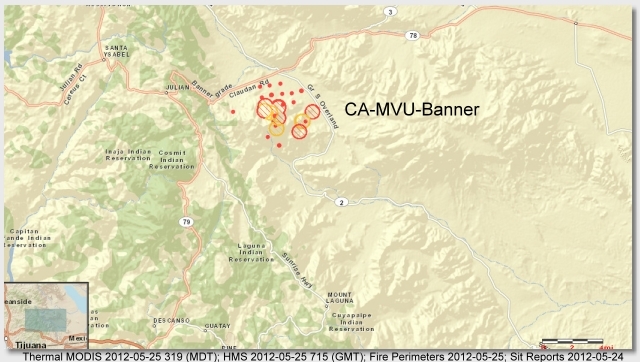 2000 5-29: CA-MVU-5400 Shelter Valley, Cal Fire IMT #9 (Zombro) Fire has burned 5,321 acres and is 95 % contained. No expected fire spread this operational period. 0800 5-26: 4,100 acres at 30% contained, Equipment mishap sparked the conflagration early Thursday afternoon in the Cigarette Hills area, near Banner Grade and southwest of Scissors Crossing, according to Cal Fire. 1200hrs 5-25: CALFIRE - ICT #9 took command. 1530hrs 5-24: 150 acres S.O.reverse 911 for Mandatory Evacuations for Shelter Valley Evac Site is Borrego Springs HS. Location: Fire is located off HWY. 78 west of Scissors crossing on Cigarette Hill, Fire is an area just north of last years 2000 acre Grade Fire. ROC: Strike teams enroute for structure protection. Has some wind on it.Fire will run out into Anza-Borrego Desert and sparse fuels.